The third wife of the Father of Federation lived at two addresses in Glebe: Auburn, 15 Allen St, and Maryville, 393 Glebe Point Rd. Julia Parkes inherited a title from Sir Henry but also his debts and responsibility for the upbringing of his youngest children, and for much of her life had to deal with financial insecurity plus hostility from the press and Parkes family members. Like the second Lady Parkes, she was excluded from many social functions. Julia was not invited to the Commonwealth celebrations in Melbourne in 1901, although two of the Premier’s daughters of his first family were. Julia Lynch was born in Virginia, County Cavan, Ireland, one of five children of Terence Lynch, a farmer, and Margaret Reilly. The family were Catholic. Leaving a brother Edward in Queensland, Julia moved to NSW around 1889. It is said that Sir Henry Parkes was a guest at a dinner given by Cardinal Moran where she was waiting at table and that Parkes persuaded his host to allow her to switch employers. However she arrived, Julia was a maid at Kenilworth, one of the Johnston St Annandale Gothic ‘witches houses’, when the second Lady Parkes died aged 38 in July 1895. Despite their age difference of 57 years, Sir Henry and Julia married the following October, a quiet wedding at St John’s Parramatta with only two witnesses, after Henry’s clergyman friend Francis Bertie Boyce, who had reluctantly officiated at the second wedding, refused to again join ‘May and December’. Six months later ‘December’ died. 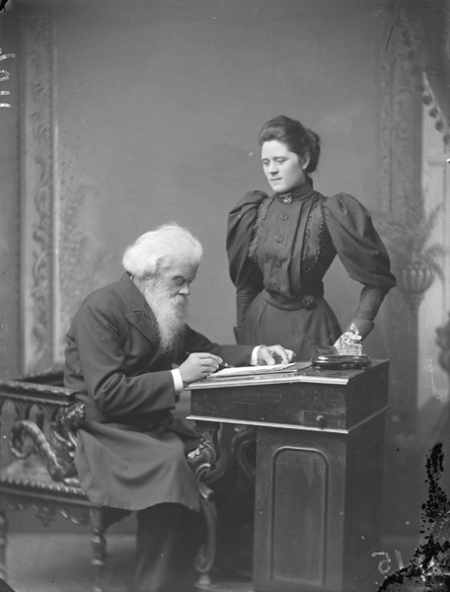 Parkes, Sir Henry, and his third wife Julia, 1895 ~ Parkes, Sir Henry, and his third wife Julia, 1895 (ON 219/415) State library of NSW. Some newspapers referred to Julia as ‘only a domestic servant’ but Henry Parkes himself was of humble background, the son of a tenant farmer and with little formal schooling. He and his first wife Clarinda née Varney, a butcher’s daughter, sailed as assisted immigrants to NSW where Henry worked for a period as an agricultural labourer. Kenilworth’s contents were sold to pay some of Henry’s creditors and the house vacated (its owner had let it cheaply because of the prestige of its tenant). Advised to look for accommodation in Ashfield, Newtown or Annandale, Julia nevertheless settled in Glebe. After buying fresh furniture, she rented a newly built brick cottage in Allen St opposite a large paddock. In 1896 there were few houses close by but within three years the area was filling up. The rent on Auburn was £75 p.a., swallowing up 75% of Julia’s personal allowance which had also to pay for the upkeep of the household: ‘Old Polly’ and the new servant, the five children, plus ‘Charlie’ the second Lady Parkes’ 17-year-old son from an earlier relationship. No doubt this was Franz Charles Meyer who was born in Victoria in 1879, his mother registered as Eleanor Dixon and his father as John Otto Meyer. How he turned up and for how long Charlie remained as part of the household is unknown, but a Charles Parkes, no occupation, is listed in the 1919 electoral roll at Glenisle, Julia’s Randwick home at the time of her death. In October 1896 a visitor noted that 24-year-old Julia was thin and her face lined. Julia would have preferred that the children receive a Catholic education, but by the time Cobby’s fifth birthday was celebrated at Allen St (with a tea party and games), Sydney and Kenilworth were boarding at Wahroonga Grammar and Aurora was attending a girls’ boarding school in Brisbane House Glebe Point Rd, run by Miss Eliza Harpur, a Methodist who also taught Sunday School at the Toxteth Church. Burglars stole £20 worth of property in a post-Christmas 1898 break-in. Just before Christmas the next year Auburn was vacated and a lease taken on a larger house Maryville 393 Glebe Point Rd with a big garden where the children could play. At the time of the 1 March 1901 census five males and five females were recorded as living there. In December that year ‘Old Polly’ died at the age of 87, and in 1902 Sydney was hospitalised with meningitis. In April 1905 Julia left to visit England and relatives in Ireland. The main object of the trip was said to be to arrange admission for 13 year old Cobden to attend a Bluecoat charity school but he remained in Sydney, attending Fort St Model School and Rev. C T Forscutt’s Rockdale College before taking up a cadetship in 1909 in the NSW government architect’s office while studying architecture at night. Sixteen year old Henry jnr, tall and with a strong physical resemblance to his father, was finishing his education at a private school after a stint as a midshipman. Aurora remained at Miss Harpur’s fashionable school in Glebe. After returning to Australia in January 1906 Julia lived at Arthurville Summer Hill before settling at Windsorlea Leichhardt, the family home at the time of Cobden’s enlistment in the First World War. In 1914 Cobden achieved honours in architectural drawing and style at Sydney Technical College but when war broke out he immediately joined up with his close friend Austral Burns and the pair sailed for Egypt in October. Both were wounded at Gallipoli and sent back to Australia to repatriate at Burns’ home at Gloucester. Burns returned to Europe and was killed in action in France. By 1915 Julia was living with Henry and Aurora at Glenisle, Cowper St Randwick. In that year both children left home. Henry, who was working with the Harbour Trust, married Katharine Cecily Rush and bought a little house in Rozelle. Aurora, tall and very fair, married ‘Curlie’ Evans, a tall and dark court reporter, and went to live at McMahons Point. Cobden, who had lost three fingers on his right hand at Gallipoli, was at Glenisle until February 1918 when he was given a new commission. After he left again for overseas service Julia was desperately lonely with only her dog and cat for company: ‘Oh, how I long for Cob’s return’. Before Christmas 1918 she wrote to Kenilworth’s widow Maud, begging her to bring ‘the nippers’ over to stay. Julia slept in Cob’s room and her bedroom and the billiards table were always ready for visitors. She would take the children to Coogee and Clovelly beach and ‘give them a Royal time’. ‘It may be the last’ she added ominously, as she was ‘a martyr to neuritis’, her knees and limbs swollen and the sinews at the back of her legs so contracted she had trouble getting on and off trams. In the last months of her life Julia (who always referred to herself as ‘mother’ of Parkes’ second brood, while Lily Parkes was an ‘ungainly step aunt’) was cared for by the Little Company of Mary before dying aged 46 at Lewisham Hospital on 11 July 1919, a month before Cobden returned to Australia. Following mass at St Mary’s Cathedral, she was buried in the Catholic section at Rookwood. There were no government representatives at the funeral and, following her predecessors’ pattern of decreasing word count, obituaries for the third Lady Parkes were brief. Sources: Armidale Express & New England General Advertiser 16.10.1896; Australian Encyclopaedia; Australian War Memorial online records; Balmain Observer & Western Suburbs Advertiser 7.1.1905; Brisbane Courier 13.6.1896; Catholic Press 15.7.1899, 17.7.1919; Clarence & Richmond Examiner 4.12.1900; Evening News 3.8.1897, 28.12.1898; A W Martin Henry Parkes: a biography; A W Martin (ed.) Letters from Menie: Sir Henry Parkes and his daughter; Methodist 17.6.1916; Mitchell Library ML MSS 5993 letter from Julia Parkes to Maud Armstrong 11.12.1918; Mitchell Library A 934 Parkes correspondence Vol. 2 ‘Family’; NSW births, deaths, marriages registry; NSW cemetery records; NSW electoral rolls; NSW Parliament Parliamentary Debates; Newcastle Morning Herald & Miners’ Advocate 18.4.1905, 7.8.1913; Northern Star (Lismore) 26.10.1895; Peak Hill Express 26.1.1906; Qld births, deaths, marriages registry; Sands Directories; South Australian Register 28.4.1896; Sunday Times 27.10.1895, 5.5.1901, 16.4.1905, 20.9.1914; Sydney Morning Herald 12.7.1919.